The essential companion for companies that need to take the tools to perform their work with them – wherever they go. 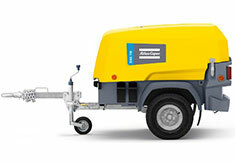 Towed and transported by vehicles across the globe, Atlas Copco's range of air compressors is ready to go, and ready to move – when you are. You can be assured of the most compact size and balanced design coupled with superior levels of efficiency. Built better: More features as standard. Breaking new ground when it comes to efficiency (at least 12% improved). The result is a compressor which can produce 110 CFM without the need for any exhaust after treatment. The 8 Series ticks all the boxes when it comes to delivering outstanding performance in all of these categories. Air compressor outlets 2 x 3⁄4"